Sit on the Dingle's sofa! Save up to 22% off the Entry Price + Souvenir RRP! The set reconstructions are replicas and not the actual interior sets used in filming, as these are in constant use for the show. You must take this tour on the date and timeslot you specify when making your booking. 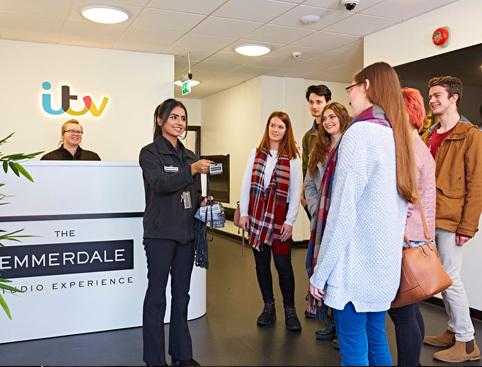 Get an exclusive look into the workings and secrets of Yorkshire’s favourite soap on a guided tour of the former ITV studios! 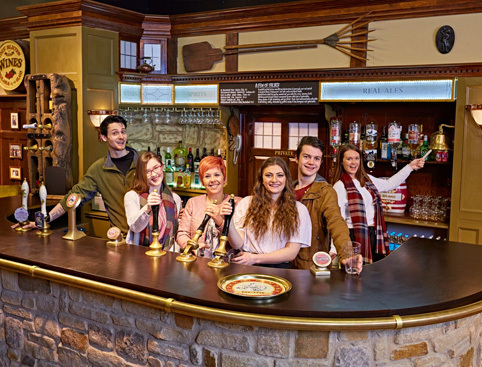 The Emmerdale Studio Experience showcases the entire ‘lights-camera-action’ process of creating an episode, and how the production team bring to life the characters you love and the stories you remember. Buy exclusive Emmerdale merchandise like David’s Shop bags, #Robron mugs and more! 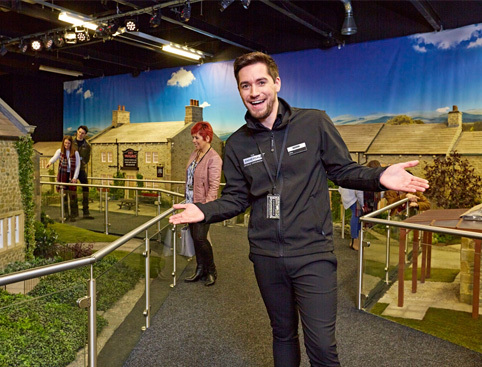 The guided tour itself lasts around 90 minutes, but you should expect to spend 2-3 hours in total to get the full Emmerdale Experience! Please Note: The set reconstructions are replicas and not the actual interior sets used in filming, as these are in constant use for the show. Important Information: If you have a requirement for a BSL Tour (British Sign Language) please note these need to be requested at least a month in advance. Please enquire with us for more details and specific needs. Please make sure you arrive at the Emmerdale Studios at least 10 minutes before your allocated tour time. The full guided tour will take approximately 90 minutes, but please allow 2-3 hours in total to get the full Emmerdale Experience! Leeds Train Station is a 20 minute walk from the Emmerdale Studio Experience or 5-10 minute taxi journey. Taxis are available from outside of the train station. There is limited street parking in the vicinity. The nearest car park is the Leeds City Council pay and display car park on Burley Road, just in front of the Emmerdale Studio Experience. Alternative parking can be found at Kirkstall Road, LS3 1JA just around the corner, a 7 minute walk from the experience. Guests in wheelchairs are able to access all areas of the Studio Experience. There is also an accessible toilet within the main entrance foyer. The Emmerdale Studio Experience can accommodate a maximum of 1 wheelchair user per tour to ensure the safe evacuation of all guests in the event of an emergency. The Emmerdale Studio Experience has an Evac+Chair available for those needing assistance on the stairs. Unfortunately mobility vehicles or electric scooters wider than 80cm are not permitted due to health and safety reasons. Visually impaired guests have the opportunity to touch and feel key props at various stages of the Experience. Registered guide dogs are welcome to join you at the Emmerdale Studio Experience! If you wish to visit with an assistance dog, please ensure you have formal identification for the dog with you. A printed script is available for guests with hearing difficulties, please ask your guide for a copy at the start of your tour. There is limited parking available on site solely for Blue Badge holders. The Pay & Display car park immediately opposite the attraction also has 8 bays where Blue Badge holders can park for free. Emmerdale Studio Experience has a café & gift shop, which you can visit before or after the experience. Pop into the gift shop for exclusive Emmerdale Studio Experience merchandise and other Yorkshire gifts! The Emmerdale Studio Experience is rated 4.6 out of 5 by 7. Rated 5 out of 5 by Lisandy from Fantastic day out I bought the tickets for me and my partner. We had a great day. Just wish we went round the village too. Rated 5 out of 5 by Unprintable from Excellent day out Bought ticket for my partner who is emmerdale mad! Went along with her and had a very enjoyable day. Staff were superb. Rated 5 out of 5 by Wilma10 from Great day out Bought tickets for my daughter and myself to visit the studios. Rated 2 out of 5 by superfan from Apalling dont bother The person who showed us around was very articulate and polite. The place itself was very disappointing. We were allowed access to about 6 locations, basically they were very dark rooms there was very little opportunity to take photos because the walls were all black and the rooms were very dark. Also she turned the lights off even before we had the opportunity to leave the room. It was an hour and a half chat for a lot of money that I didn't have because I had just lost my job but wanted to treat my daughter for her birthday as she has been asking to visit Emmerdale for about 5 years. I travelled about 400 miles by coach to the studio experience and was very disappointed, because it was just a chat. for an hour and a half. There were some special effects in one of the rooms that my daughter enjoyed. They tried hard with the special effects and we liked the clothing gallery and the crash area. I didn't expect to meet the characters, but they could have given us better photo opportunities. They allowed us to film a few short words on Rhona's sofa which was emailed but when we arrived home there was no sound because we had no mikes on. You might get more from visiting the village, rather than the studio experience alone. There was one positive the items in the shop were reasonably priced. Rated 5 out of 5 by Shannon from An amazing day out! My mum, dad and I had a fantastic time, thanks to our amazing tour guide Sophie!